More than 30 Devon beaches have been named among the best in the country by an anti-litter campaign group. Independent national charity Environmental Campaigns (ENCAMS) - organisers of the Keep Britain Tidy Campaign - has selected 33 beaches in the county for its annual seaside award. They are among a record 332 beaches in Britain to receive the honour which recognises water quality, cleanliness of beach facilities and the availability of first aid. 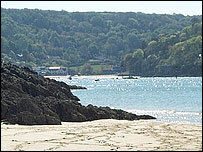 Among the beaches making the grade for the first time is St Mary's in Torbay. The award winners have passed strict tests on beach management. These include making sure they provide first aid facilities, good access for disabled visitors and have sands that are free of litter and dog dirt. Additionally, the water has to be up to European Union minimum legal standards for cleanliness. This information, together with details on all the facilities on offer at the beach, must be displayed on easy-to-read signs. ENCAMS regional director Amanda Booth said: "People don't just come to the beach to swim. "If you have got a young family, you want lots of facilities as well and you want them to be clean and well-maintained. "Our awards are special because they cover the whole beach experience and show they are really well managed." Across the UK, 332 beaches received seaside awards this year, compared with 317 last year. When the awards began in 1992, only 92 beaches made the grade.